The boss has organised another reserve match for his fringe players to stay up to speed for the final five games of the League One promotion push. And it offers those on the comeback trail from injury the chance to regain match fitness as they look to thrust their way into the first-team frame. The Blues travel to AFC Bournemouth’s Canford Arena training ground today (1pm), with a strong side set to feature. It comes after last week’s 1-0 victory at Fulham, while there were wins overt the Royal Navy and Swindon respectively last month. Viv Solomon-Otabor and Dion Donohue are both earmarked to play their first games after spells on the treatment table. The former has missed Pompey’s past four games after limping out of the 2-0 win over Scunthorpe on March 16. The Birmingham loanee is held in high regard by Jackett and he’ll want Solomon-Otabor back to enhance his attacking options. Donohue also hasn’t featured since that triumph over the Iron, coming on as an 89th-minute substitute. The Welshman picked up a groin complaint playing in the reserves’ 3-1 victory against the Royal Navy three days later. Donohue has endured a hapless season with injuries, as well as glandular fever. 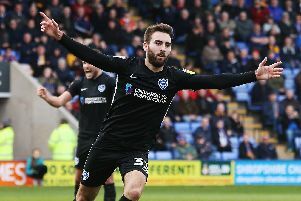 The 25-year-old has underlined his quality when he has played, though, and adds something different to Pompey’s midfield pack. Andy Cannon continues his rehab from a quad injury that sidelined him for almost three months. The January arrival from Rochdale has featured just twice for Jackett’s side but was handed 70 minutes against the Cottagers in the No10 role. Bryn Morris has been an unused substitute in the past two League One fixtures after he was out for more than a month with a groin setback. He also featured at Fulham and will be looking to impress as he bids to dislodge Ben Close from Jackett’s starting XI. The likes of Brandon Haunstrup, Anton Walkes and Louis Dennis have been on the periphery of the promotion push. However, Jackett is making sure they are match ready if they’re required at this late stage.